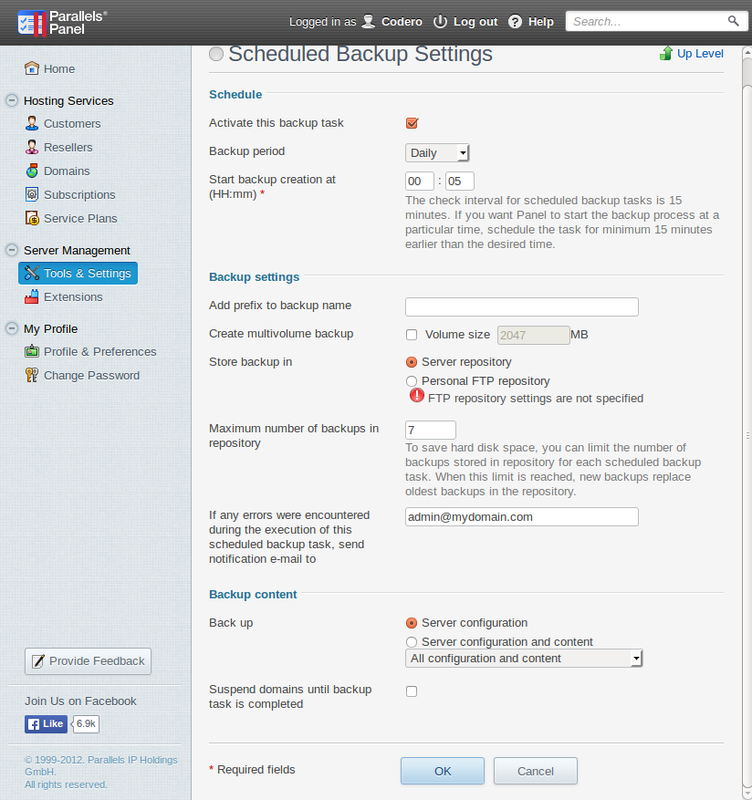 This article is designed to help you setup an unmanaged eVault backup for your Codero Server. While this artice is intended for dedicated server users with a Plesk control panel, the principles can be applied to users of other control panels no control panel. The setup is divided into 3 sections. Plesk Setup, Server Setup, and Evault Setup. It is strongly recommended to perform these in the order they are written. 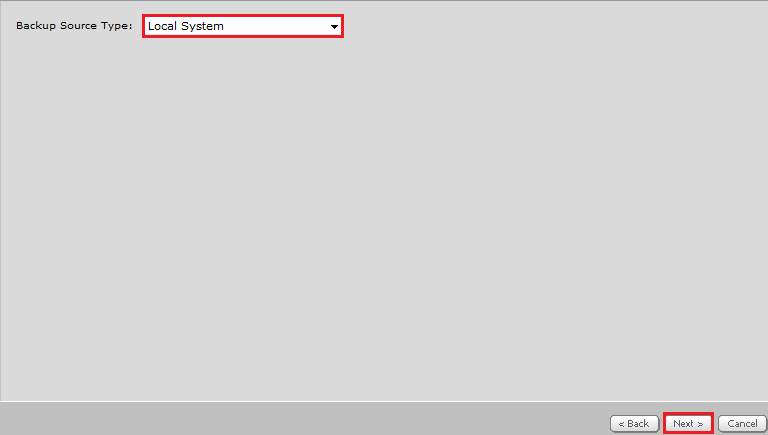 From the Backup Manager screen, click the Scheduled Backup Settings icon. Check the “Activate this backup task” checkbox. Set a starting time for the backup. The start time must be entered in 24 hour time. Enter “13” for the hour if you want 1:00 pm. Leave “Create multivolume backup” unchecked. 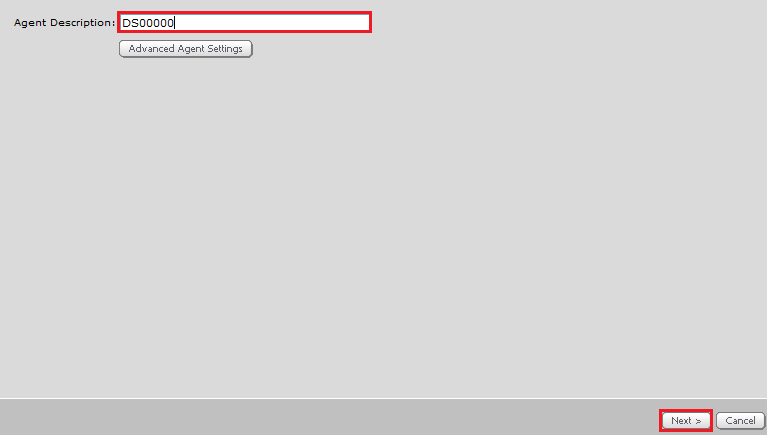 You only need to select “Server Configuration” because eVault will be backing up your content. Failure to select “Server configuration” may quickly result in excessive eVault usages and unwanted overage fees. Leave “Suspend domains until backup task is completed” unchecked. Finally, click OK to save your settings and return to the Backup Manager screen. 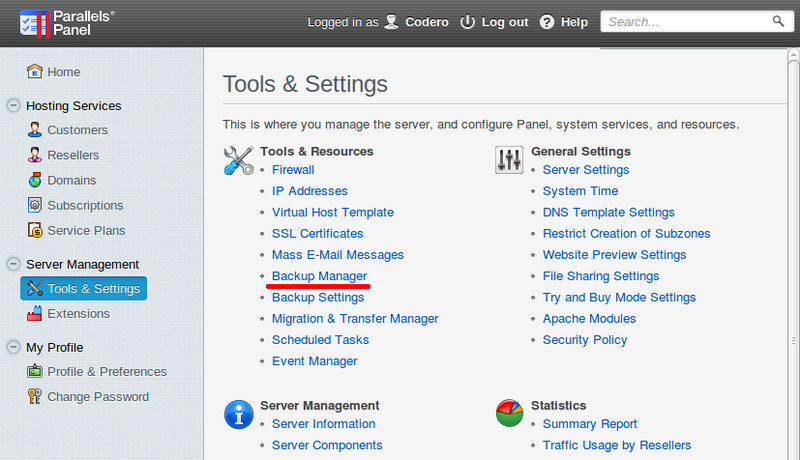 To create the inital backup, click the “Back Up” icon on the Backup Manager screen. During our test, it took less than 2 minutes to create the intial backup. This section shows you how to setup your server to create unique backup files for each MySQL database. This will allow you to restore any database without requiring you to restore all databases at the same time. Log into your server as user “root” with your root password. This script uses the “mysqldump” command to create unique backup files of each MySQL database on the server. mysqldump -uadmin -p`cat /etc/psa/.psa.shadow` $db > "/usr/local/codero/dumps/$db.sql"
The cron script below is set to run daily at 12:05 AM. 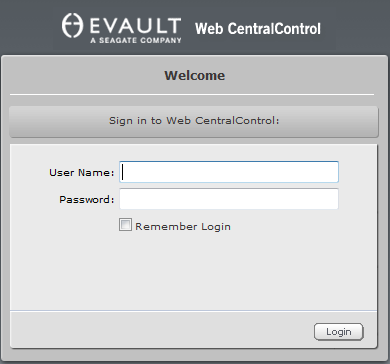 Log into the eVault control panel http://webcc.codero.com/Login/login.aspx with the username and password you were provided. By admin on October 27, 2014 | Backup, Plesk | A comment? 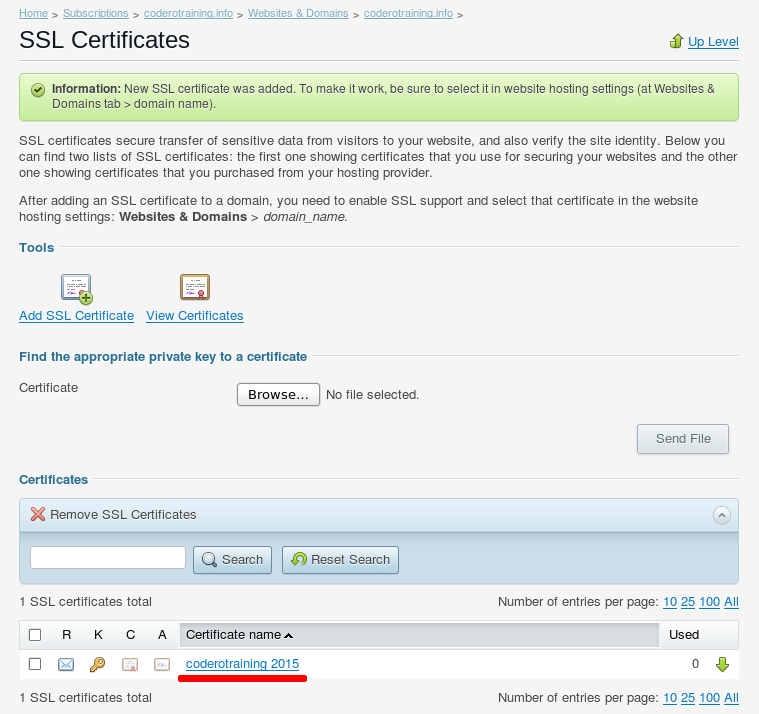 Adding an SSL certificate in Plesk is a multi-step process. Understanding what SSL is and how it works will make this process much easier. Secure Socket Layer (SSL) Certificates are used to encrypt all data sent from your server to the client, and from the client back to the server. The use of SSL is strongly recommended when allowing a user to enter sensitive information such as passwords or credit card data into a form. Without the use of SSL, the data is transmitted over the Internet in a plain text format that a malicious users could read without issue. By using SSL, the data is encrypted, rendering the data virtually impossible to read. 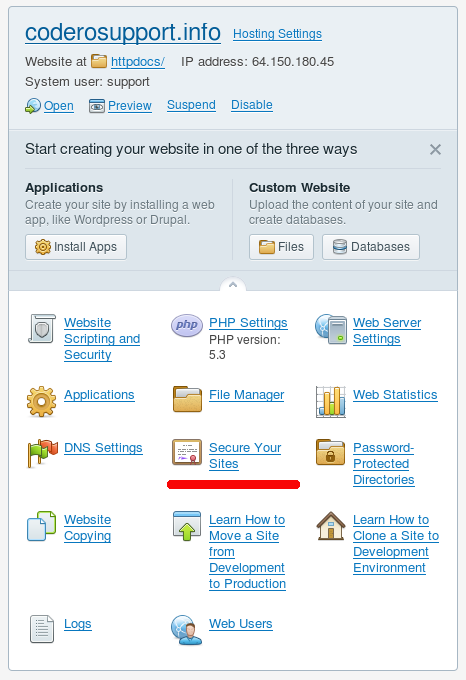 Once applied to a website, the encryption is used when accessing the website using https://domain.com instead of the standard, unencrypted http://domain.com. You might notice the ‘s’ in ‘https’ stands for “secure”. SSL works by encrypting the information from the server to the user by utilizing encryption keys. A private key on the server is used to encrypt the data and a public key that is provided in the SSL certificate is used to un-encrypt the data. Conversely, information sent by the user is encrypted using the certificate and that information can only be un-encrypted by the private key on the server. Because only the public key can un-encrypt the information encrypted by the private key and only the private key can un-encrypt data sent by the public key, it is extremely important that they remain in pairs. You cannot mix public an private keys from different certificates. There are a maximum of 4 certificates, depending on your situation. The Private Key is the glue successfully installing an SSL Certificate on your website. This certificate is used to create the CSR, which in turn, is used to create the Public Key. The Public and Private keys then work together to create a secure connection between the server and the user’s browser. The Private Key and Public Key must match in order for the connection to work correctly. This key might also be referred to as the SSL Certificate. This is the certificate you receive back from a Trusted Provider after submitting the CSR. The Public keys works with the Private Key to encode the information transmitted between the server and the user’s browser. The CA Certificate is provided by a Trusted Provider when purchasing an SSL Certificate. This certificate lets the browser know the SSL certificate was issued by a trusted provider and prevents the browser from displaying warning messages. 2. 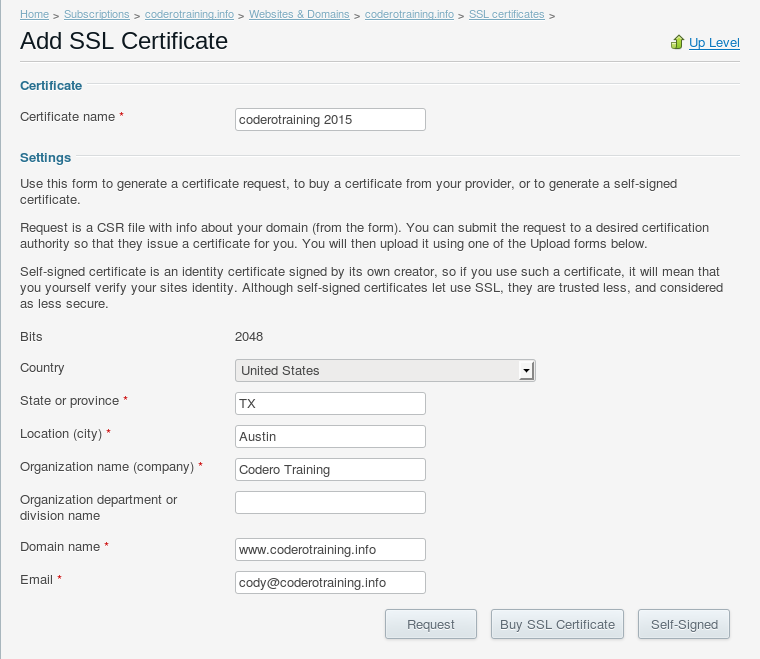 Submit the CSR to a Trusted Provider (also known as a Certificate Authority) and purchase the SSL. 3. 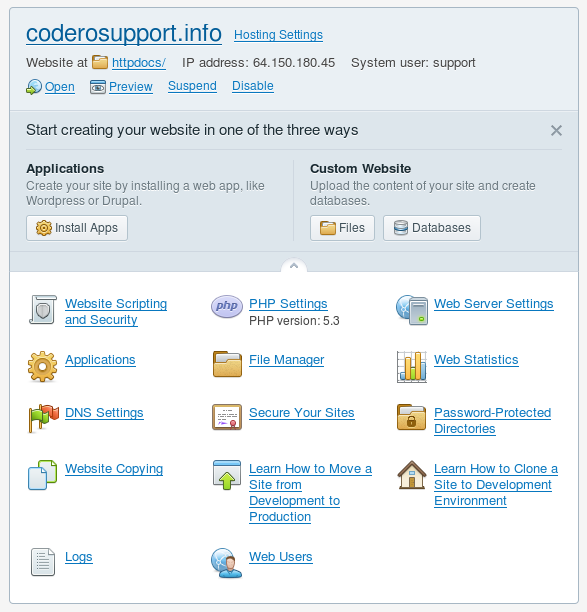 Upload the SSL files to the server. 4. 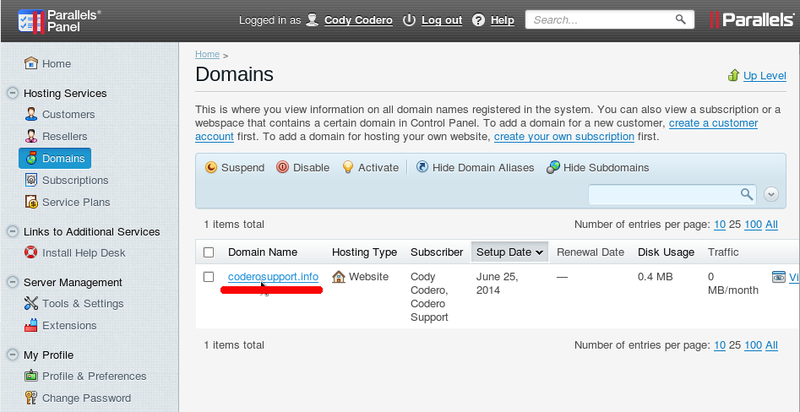 Apply the new certificate to your domain. 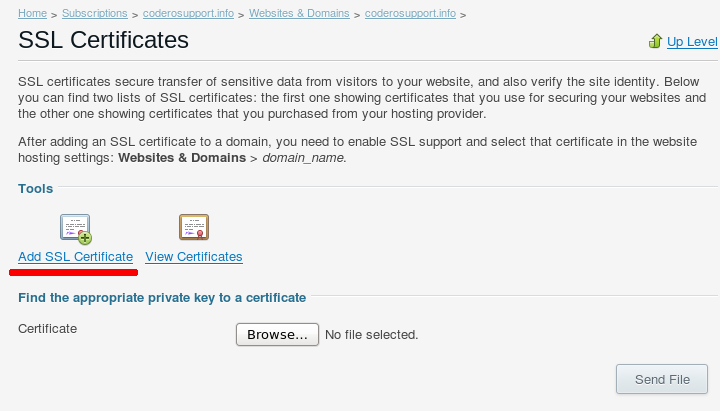 Under Add SSL Certificate, you’ll need to fill out the CSR Request form. Certificate Name: Enter a unique name for the certificate. You can use any name you wish as long as it is unique. I recommend using the domain name and the current year. Country: Select the country the business is based in from the dropdown box. Location (city): Enter the city the business is located in. Organization name (company): Enter your business name. Domain name: Enter the domain name. 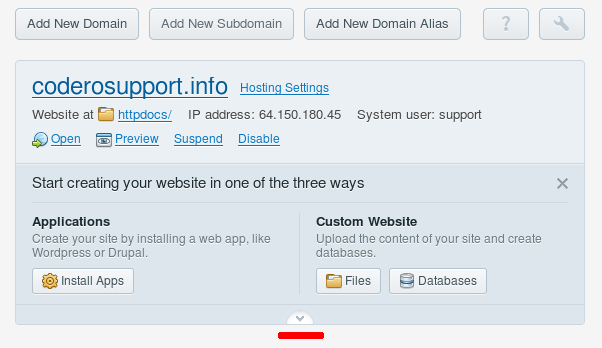 If you are applying the certificate to a specific subdomain (sales.domain.com or blog.domain.com), make sure you enter the exact subdomain. Email: Enter your contact email address. Once you have filled in the form, click Request. After your CSR is generated you will be returned to the SSL Certificates page with a notice saying the new SSL certificate was added. To view the CSR, scroll down the page under Certificates and click on the certificate name you created in the previous step. You’ll notice to the right of the certficate, there are some small icons under the letters R, K, C and A. These represent the certificate files that have been created. R=Certificate Signing Request, K=Private Key, C=Public Key and A=Signing Authority. The icons that are displayed in full color represent the files that have been created and the icons that appear greyed out represent the missing certificates. On the “Change Properties of SSL Certificate” page, scroll down the page until you see “CSR” . The text displayed starting with “- – – – – BEGIN CERTIFICATE REQUEST- – – – -” through “- – – – -END CERTIFICATE REQUEST- – – – -” is the text you will provide to a 3rd party certificate provider. Copy the entire text, including the Begin Certificate and End Certificate lines. By admin on June 26, 2014 | Plesk | A comment? By admin on June 7, 2014 | Plesk | A comment?